If anyone knows something about hard drives, it’s Backblaze, whose very existence depends on the reliable, stable backup of its customers’ data. 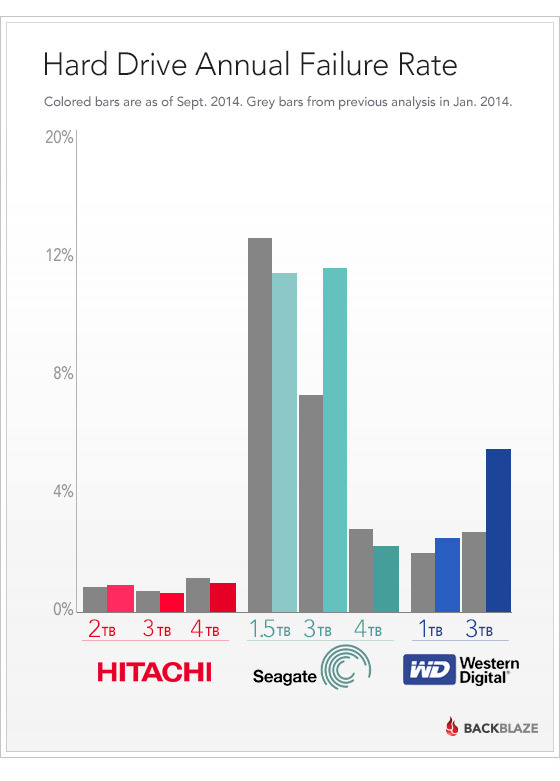 Earlier this year Backblaze published a report that detailed their operational experience with hard drives from Seagate, Western Digital, Hitachi and others. Just last month, they updated their findings based on the 34,000 hard drives they have deployed today. Read the entire report here. This is great information, and this year’s earlier report informed my decision about what external hard drive to buy for home backup purposes (spoiler alert: I went with Western Digital). Tags: backblaze, backup, hard drives, reliability Posted October 9, 2014 by Jeff V.